FINAL DECISION: This book was just okay. I enjoyed most of the relationship and story but I couldn’t relate how Sophie reacted to being blackmailed. Her irrational behavior just bothered me throughout. THE STORY: Mrs. Sophia Armitage, as the wife of an officer, followed the drum during the war became the friend of the Four Horsemen. Now a widow, Sophie resides in London and for the first time in three years, meets up with Nathaniel Gascoigne — a man that even a respectable wife could admire. Now an opportunity for a special kind of friendship between the two arises and both are surprised by the intense passion that arises. Their fledgling relationship is threatened by the fact that Sophie has a secret — she is being blackmailed. OPINION: I liked how this book developed in the relationship between Nathaniel and Sophie. Two adults who want physical companionship begin to develop an emotional connection that they didn’t expect. They were sweet together and I liked them. Unfortunately, the blackmail plot drove most of the action in the story. Because of that Sophie’s continuing actions in giving in to the blackmail began to wear on me. Not because I didn’t understand that she was afraid and wanting to be independent and used to hiding. What I expected was that once the blackmail was revealed that she would gain a stronger emotional connection with Nathaniel by admitting her fears and anger. Instead, the story fell flat emotionally for me at that point. 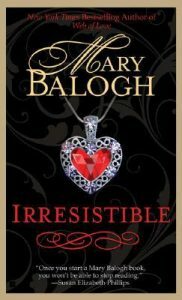 I’m a big fan of Mary Balogh especially her restrained emotional intensity but I think this book was too emotionally restrained for me. On the other hand, I loved the ending where Nathaniel confesses his love for Sophie. I thought that moment was almost perfect. WORTH MENTIONING: Fans of the series will know that there are four horsemen and thankfully although there are only three books, the fourth horseman gets his HEA in a secondary romance in this book. CONNECTED BOOKS: IRRESISTIBLE is the third and final book of the Horseman Trilogy. It takes place 2 years after the events in the first two books in the series. Although characters from those books appear, this book does not rely on those books at all and thus it can be read as a standalone.